Tip 3. Don’t rely on rote learning. There are tips and tips. For example, some people think that showing seven times eight as, 56 = 7 x 8 (5678) is a tip or ‘I ate (eight) and ate (eight) until I was sick on the floor (sixty four)’ so 8 x 8 = 64, is a tip. It could be argued that they are indeed tips, but they are one-off mnemonics to access single facts. They don’t explain what the symbols 8 x 8 = 64 mean and why they make numerical sense. So my big daddy, overall, super-top-tip is, ‘Teach them to understand.’ Let me explain why, so that there is an understanding of teaching to understand. One of the key problems for dyscalculic learners is retention of basic facts and maths procedures in their long term memory. But do note that, like most of the learning problems in maths, this is not exclusive to dyscalculics. There will be a spectrum of abilities to memorise maths information. For example, I often ask when lecturing for teachers, ‘How many of your ten year olds do not remember all their times tables facts?’ This is now a big sample of teachers. The modal answer is 60% to 70%. There are many programmes on-line and books in shops that claim to ‘teach’ time table facts. I think that all, or almost all, rely on rote learning, a belief that somehow a catchy tune or a cute illustration will do the trick. 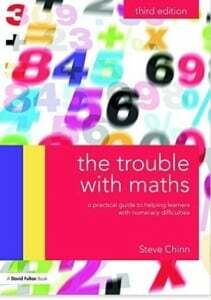 Problems with dyscalculia are, to paraphrase Ben Goldacre, ‘a little more complicated than that.’ As a parallel, it would be unrealistic to expect to teach a dyslexic perfect spelling by a series of quick fixes (though some of the snake oil persuasion have tried to sell this enticing prospect). And there is an added issue, ‘purfection’ is not perfect, but it is close enough for recognition. 7 x 8 = 64 is just ‘wrong’. If used within a complex calculation, ‘close enough’ is not good enough. Maths works in a very unforgiving way. Children can be shown how ‘chunking’ can help them work beyond ones. Again objects set out in recognisable patterns create the foundations for developing this skill. Try comparing objects set out in patterns with random sets. That question, ‘Is it bigger or smaller?’ is useful again. A child can learn to count to ten, but writing ten as 10 is a very sophisticated task in terms of understanding how that communicates ‘ten’. This can be demonstrated as a cognitively developmental sequence, using base ten blocks on a place value card as the starting point and then weaning the child down to using the symbols (digits) on their own. If a child (or adult) predicts that they will get a task wrong, then they will, quite reasonably, avoid it. This is a fear of negative evaluation. Most of us experience this about something. If you don’t try you don’t fail. That requires setting a classroom, and home, ethos that allows a child to fail without that failure creating another step up the withdrawal ladder. High levels of anxiety, usually specific to maths. If long term memory for maths is poor, then the child needs support to remember the often quite complex formulas we use in maths. It is a huge help if the child understands what he is doing and why. The steps should make sense and the task as a whole should make sense. Since maths builds, this will usually require a sound understanding of the pre-requisite work. Hence the need to revise, again and again. It is of no use what-so-ever to say to a child, ‘I’ve told you this ten times, you should remember it.’ Ten times without understanding is a waste of times. Use materials and visuals (alongside the symbols and digits) to develop understanding. It is, as Margaret Rawson said, a matter of teaching maths as it is to the child as he is. You need to understand both. 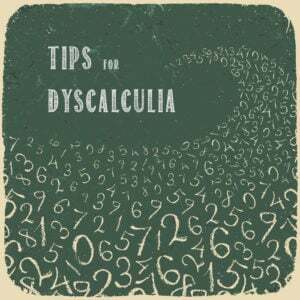 — What is Dyscalculia? We’ll post our video below as well as the webinar Steve generous presented to Dyslexic Advantage. THANK YOU FOR YOUR TIPS AND YOUR YOU TUBE VIDEO ITS VERY INFORMATIVE. I HAVE REMOVED MY SON FROM MAINSTREAM SCHOOL DESPITE EVERYONE BELIEVING I AM CRAZY FOR IT.. AT PRESENT MY SON HASN’T BEEN DIAGNOSED BUT HAS GONE THROUGHOUT THE LAST 4 YRS OF SCHOOL BEING TOLD HE’S AUTISTIC., ASPERGERS OR HAS SPEECH AND LANGUAGE DIFFICULTIES WITHOUT ANY DIAGNOSIS. EITHER WAY DESPITE THESE HURDLES I ACTUALLY BELIEVE MY SON HAS DISCALCULAI BUT I DO NOT KNOW WHERE TO BEGIN. You can search for other math posts in the search bar on the right. Premium articles have more in-depth practical information regarding strategies. If you’d like to hire a tutor, check out our “Dyslexia Tutors” under our Programs tab. Some tutors also tutor math and are available online as well as in certain cities.